On several of my wanderings these past few days, I have heard noticeable buzzing sounds that indicate an acceleration and flyby of a large winged insect. I recognize these sounds to be from a fascinating group, the robber flies, family Asilidae. I remembered posting about them last year and when I looked it up, it was almost exactly the same week last summer when I started seeing these amazing aerial predators in the yard. And, once again, the first one I saw with a prey item last week had managed to capture a honey bee. Their preference for bees is one reason this particular species is also called the false bee-killer (although not really so false). 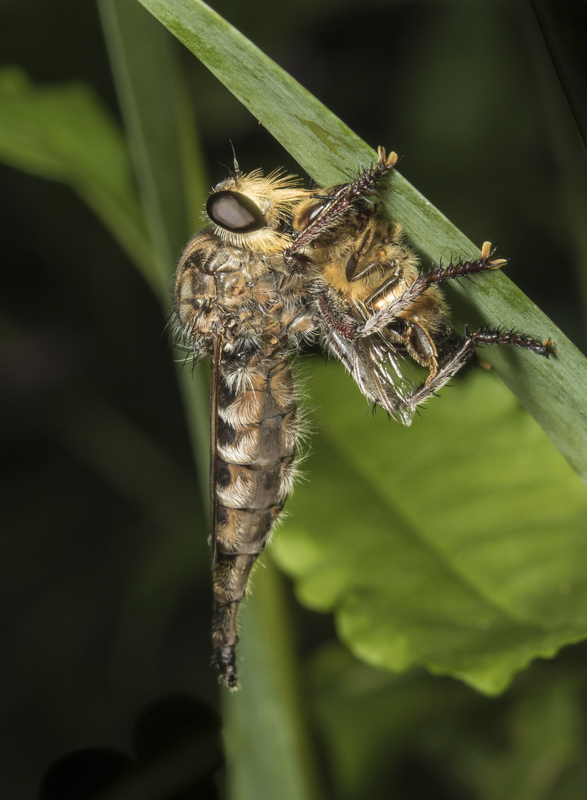 A closer look reveals some of the adaptations that make robber flies so efficient at catching their prey, which, by the way, they almost always do while on the wing. They have huge eyes for spotting flying insects; large wings powered by strong muscles in the humped thorax; and long spiky legs that help them maintain a grip on something once they have grabbed it in mid-air. This one did what they all do after catching something – flew to a perch to start consuming its prey shortly after capture. 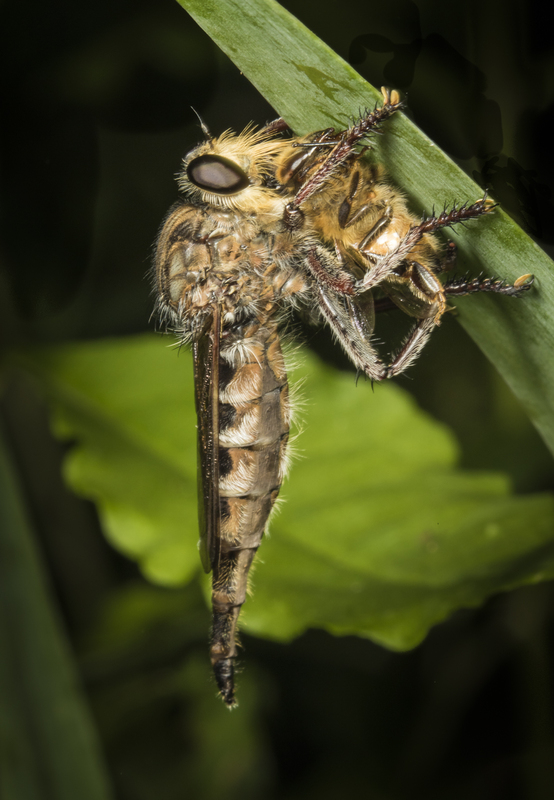 Robber flies pierce and inject their victims with toxins that immobilize the prey and begin to liquefy them. They then fly to a nearby perch and begin to imbibe on the internal soup of their quarry. This time, however, the meal was interrupted. What had drawn me to this particular perched fly was an intense buzzing sound, not made by this fly, but by a male robber fly hovering nearby. The male had the distinctive white patch at the tail tip I had seen last summer that allowed me to identify them as Promachus bastardii, which Bug Guide calls the Big Robber. Turns out, this loud, stationary buzzing is a prelude to mating. And, sure enough, the male waited for just the right moment and then jumped on the larger, feeding female. The act didn’t last long as I heard another buzzing sound and saw another male hovering nearby…the lady has two suitors. The first male buzzed off and the other male followed, so perhaps a territorial duel ensued elsewhere in the yard. The female, meanwhile, continued feeding. That is, until I accidentally brushed her perch while trying to lean in closer for a better view. She immediately buzzed by my head, carrying her unfinished lunch to a less crowded perch. She will eventually lay eggs at the base of plant or in soft soil or rotting wood. The larvae are rarely seen, but resemble odd worm-like creatures living in soil and soft wood where they consume organic matter and start their predatory career by capturing soft-bodied prey around them. Larvae pupate in the soil and emerge next year, or perhaps a year or more later. I guess I will need to be on the lookout for some egg-laying behavior and see if I can’t find a larva. In the meantime, I’ll listen for that buzzing sound and see what’s for dinner. 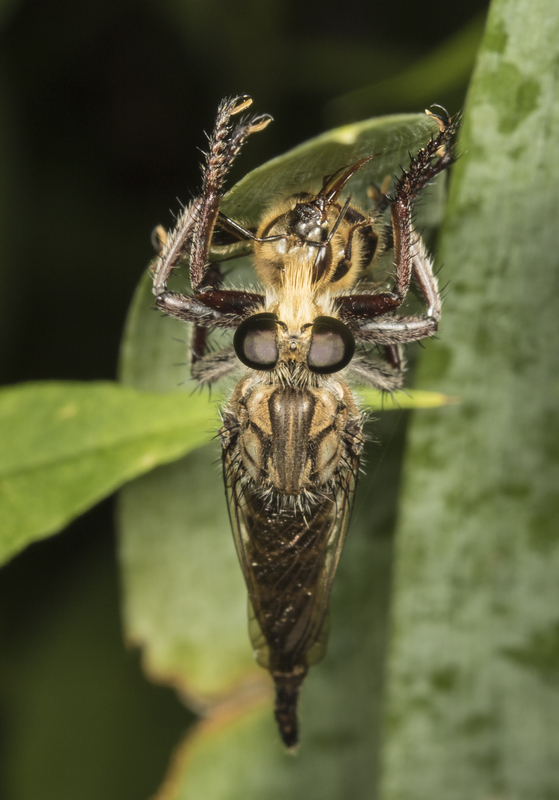 This entry was posted in Natural History and tagged robber fly by roadsendnaturalist. Bookmark the permalink. wow, not my favourite animals 😉 but pictures are excellent! Thanks. They are pretty amazing insects, and oh-so-efficient at what they do. Fascinating. I have never even heard of the robber fly. I hate to see the decline in our native bee population – it is really beginning to affect my garden – particularly squash. Thanks for the great pictures and narrative. 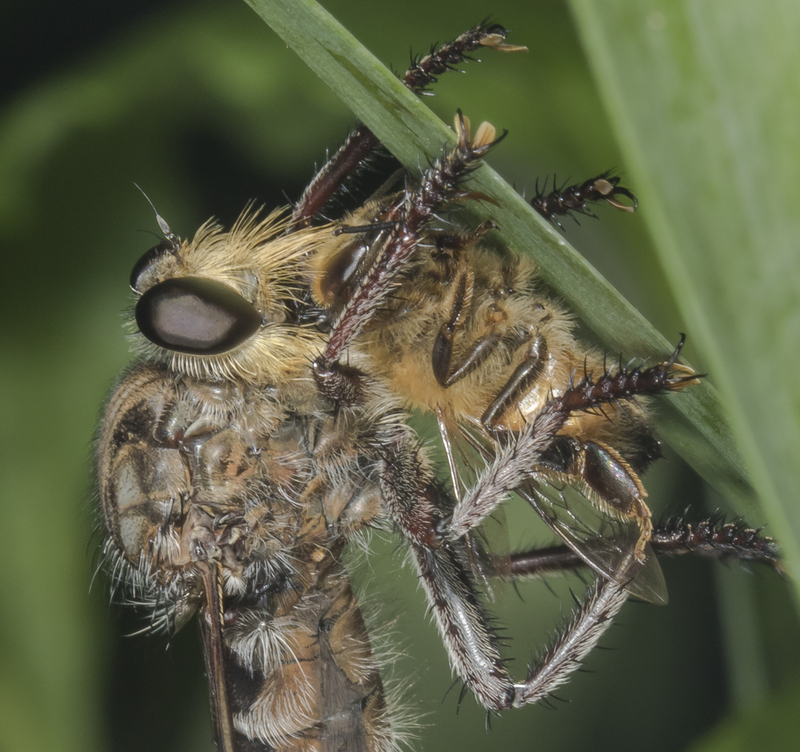 Hey Tad – Luckily, the robber flies probably aren’t responsible for a big decline anywhere, but pollinators are having a tough time fora variety of reasons. Best to plant a variety of native plants and limit pesticide use to help them all. Very cool that you caught them mating!